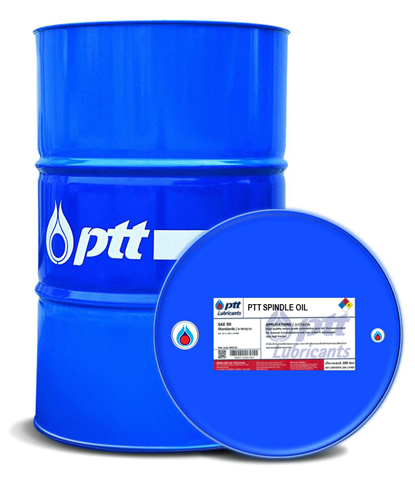 [PTT SPINDLE OIL] ผลิตภัณฑ์หล่อลื่นอเนกประสงค์ชนิดความหนืดต่ำพิเศษไม่รวมตัวกับน้ำ ผลิตจากน้ำมันหล่อลื่น พื้นฐานคุณภาพสูง ผสมสารต้านทานการสึกหรอและสารป้องกันการเสื่อมสภาพจากปฏิกิริยาออกซิเดชั่น เพื่อเพิ่มประสิทธิภาพในการหล่อลื่นพร้อมการปกป้องเครื่องจักรขนาดเล็ก Special low viscosity multi-purpose lubricating oils which produced from high refined base oil, blended with anti-wear and anti-oxidation additives to provide high performance in high speed spindles and automated machine tools. • Designed for high speed spindles in machine tools. • Suitable for high speed industrial machines which include plain and rolling bearings. • Extra low viscosity grade to provide efficient penetration for small and high speed machinery. • Effective rust and corrosion inhibitors protect equipment under humid operating conditions. • Prevent formation of damaging deposits and varnish at elevated temperatures.